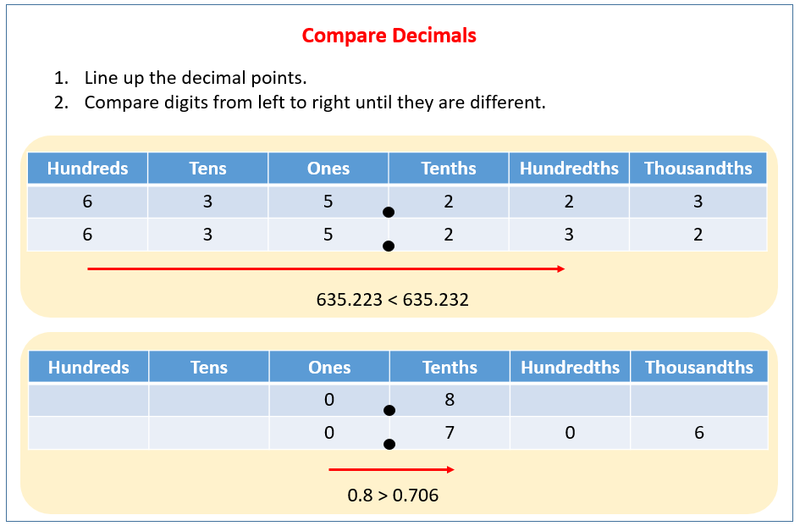 The following tables show how to compare decimals using the place value chart. Scroll down the page for more examples and solutions. Problem 2: Compare 0.012 and 0.002. Problem 4: Order from least to greatest: 0.413, 0.056, 0.164, and 0.531. 1. Show the numbers on the place value chart using digits. Use >, <, or = to compare. Explain your thinking to the right. 2. Use >, <, or = to compare the following. Use a place value chart to help if necessary. 3. Arrange the numbers in increasing order. 4. Arrange the numbers in decreasing order. 1. Use >, <, or = to compare the following. 2. Arrange the numbers in increasing order. 3. Arrange the numbers in decreasing order. b. 439.216, 439.126, 439.612, 439. 4. James measured his hand. It was 0.17 meters. Jennifer measured her hand. It was 0.165 meters. Whose hand is bigger? How do you know? 5. In a paper airplane contest, Marcel’s plane travels 3.345 meters. Salvador’s plane travels 3.35 meters. Jennifer’s plane travels 3.3 meters. Based on the measurements, whose plane traveled the farthest distance? Whose plane traveled the shortest distance? Explain your reasoning using a place value chart.